Boston Handmade: Boston Handmade Downtown - only TWO weeks left to shop for handmade holiday goodness! Boston Handmade Downtown - only TWO weeks left to shop for handmade holiday goodness! Week three in Downtown Crossing has come and gone, and I am pleased to report that the Boston Handmade Downtown gallery is thriving! We had visits this past week from many "special guests" including the City of Boston's own Mayor Thomas M. Menino. Colleen reported on this visit yesterday, and gallery volunteers are all a buzz about the Mayor stopping by. 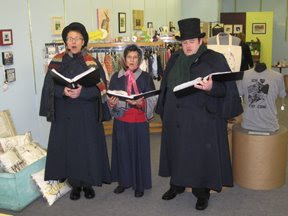 Another joyous moment happened when costumed Christmas carollers came into the gallery, took requests, and serenaded volunteers and customers with their beautiful singing. 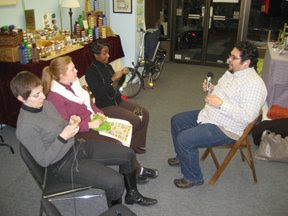 Our podcast interview with Guido Stein of It's a purl man was published this past week too, so have a listen here! Thanks again for visiting and chatting with us Guido! The other BIG news about Boston Handmade Downtown is all the amazing, handmade arrivals that keep rolling into the gallery each week from our 30 exhibitors. 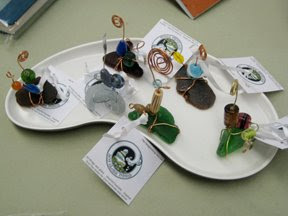 Here is a selection of whimsical photo holders created from sea glass, wire, and beads, made for you by Marla of Sea Glass Things. 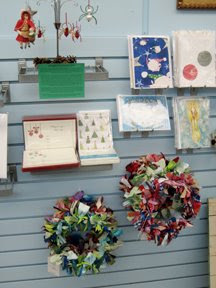 Marla also delivered new seaglass housewares this past week, shadow boxes, and earrings. In their continued support of Boston Handmade, Etsy.com sent some items for our gallery that they have asked us to sell and keep the proceeds to help with the costs of running the gallery. 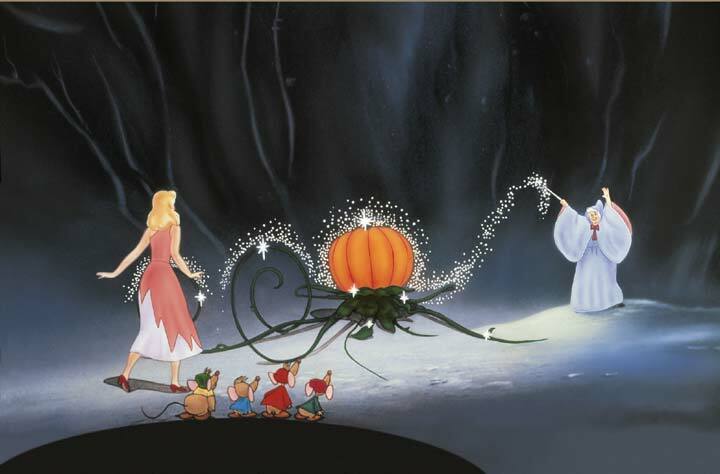 Etsy, your generosity knows no bounds - thank you! 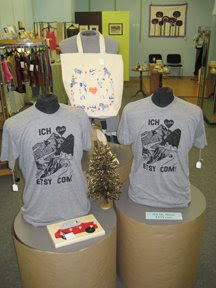 We are proud to offer Etsy tote bags and T-shirts for your shopping pleasure. Also fresh for shoppers this week is a brand new array of seasonal greeting cards by Weller Wishes, All The Numbers, and thirteenthstory, holiday wreaths by Breton Bleu Studio, lots of new ornaments by muchacha K, Sea Glass Things, K. Hawkins Photography, Lucie Wicker Photography, Vintage by Crystal, and Lush Beads. With only 5 shopping days left to the first night of Hanukkah, and 8 days left to Christmas, and only two weeks left of Boston Handmade Down, make sure to check us out and see all the handmade goodness before it turns into a pile of pumpkins!